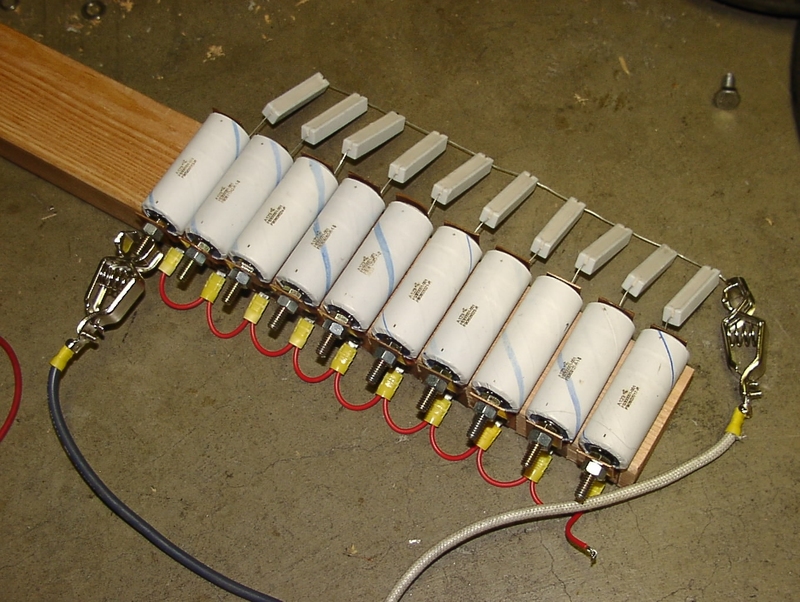 Here is a charging fixture that I made today to charge 10 A123 cells at the same time. I machined slots into the wood to keep the copper plates from rotating. There is also a 1/2 inch wide slot under each cell to hold them in place. The power supply is set to 3.70v. Each cell can reach its finishing voltage separately from the others due to a one ohm resistor feeding each cell. The other important thing the resistors allow is that a drained cell can be put into the fixture next to a fully charged one. The charging takes a little longer with the resistors, but it gets them all fully charged equally. Then I can load test them one at a time to see what their capacity really is with a 50 amp load. There are currently 30 cells awaiting testing. A group of 10 cells in parallel will eventually find its way into a module that will replace a nicad cell in the #1 truck. A complete pack will only take up the driver’s side half of the battery box. The trick will be to make a BMS board that will fit on top of the closely spaced cell posts like the nicads have. Thundersky load testing from down under. Here are a couple of links for Thundersky cell load tests. 1, 2 . Thundersky 160ah board done, for now. The board layout for the 160ah Thundersky/Sky Energy lithium cell BMS is finished. I’d like to scale it down to also fit the 90-100ah cells, but that takes another board layout session since the 160ah cells are so large compared to the 90-100ah cells. For now getting the thermal paths, thermal cycling, and basic operation tested is a higher priority. Making a board that will fit both the 90-100ah and 160ah cells would be the next task. At this point it’s setup to bypass 3 amps. 5+ amps is possible. The BMS will control the charger output as well as the motor control if any of the set points are hit. I’ll get the BMS to Dolphin interface board going as well.